Free delivery to most areas! Request a quote today for a guaranteed great deal on a 5,000 gallon tank. Our 5,000 gallon round “Super Squat” tank is most suited to large blocks in town or rural properties. Click here to read more, or contact one of our friendly sales representatives for an obligation free quote. Free delivery to most areas! 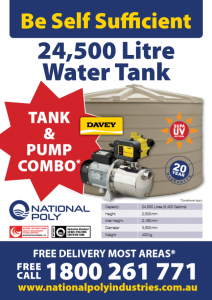 Request a quote today for a guaranteed great deal on a 5,400 gallon tank. Our 5,400 gallon round water tank on your property could make you self sufficient with your water usage. Not yet ready for a tank? You can lock in our specials by ordering today to deliver any time in the future. Nothing upfront to pay, cancel at any time, entirely obligation free!